Need a question answered? Read our Frequently Asked Questions below to answer the most common questions we receive. Questions sent to us through our Contact Us page are replied to Monday – Friday from 8am – 4pm CST, excluding holidays. My package has not arrived and might be lost. What should I do? Please Contact Us with the relevant information and we will open a claim with the shipping company. We ship all items on the next business day, excluding holidays. Many items we are able to ship overseas except for printers and a few other items. We do not ship to P.O. Boxes, only physical addresses. If you purchased from us through a 3rd party that accepts PO boxes then we will gladly ship there. In many cases we offer express shipping. In these cases we will list it as an option for an additional price. Do you ship in the original HP box? No, we do not ship in the original HP box, only in a refurbished box. Some of our boxes are very high quality so it is possible that you might mistake a refurbished unit for a new one! The return policy for products varies by seller. Below are links to common marketplaces you can find DealScoop products. For products purchased directly from DealScoop, from our websites, or Ebay stores, we offer a 30 day money back guarantee on the products we sell. With valid proof of purchase we’ll also pay the return shipping costs if the return is a result of our error (you received an incorrect or defective item, etc.) For non-defective returns you are responsible for return shipping costs and in some cases a 10% restocking fee. All product returns require a Return Merchandise Authorization (RMA) number before being returned. You may obtain an RMA number by contacting DealScoop’s Customer Service Department on our Contact Us page. Be sure to include your order ID and reason for return to ensure proper processing. All items must be sent back in the condition they are received, in original product packaging without damaging the retail box and must include all components and accessories. Serial numbers and condition of item returns will be confirmed by our returns department and if any return is sent back in an unacceptable condition, it will be refused. Our products carry a 90 day limited warranty from the date of product purchase, fulfilled through DealScoop. If you purchased your item through a reseller other that DealScoop we recommend contacting them first for their individual warranty program. To make a warranty claim, fill out the form on the Contact Us page with your purchase information and nature of the problem. Once approved your product will be repaired and/or replacement with the same make and model or one of equivalent or greater value. Detailed warranty information can be found on our Warranty details page. What can I expect when I receive a “refurbished” product? We make every effort to ensure your refurbished product performs similar to a new product. Whenever we are unable to provide you with a like-new item we price the product according to condition and available accessories. Below are some common refurbished points. Do the pictures I see online match the product I am buying? If products are A-Grade (new in box) or B-Grade (like-new but refurbished), we use stock photos which accurately represent the condition of the product. Products listed as C-Grade have minor scratches to the surface of the item or small scratches on the screen. These products may use a photo we have taken of the same product but not necessarily representing the same location and size of wear as the product you receive. We make every effort to accurately match C-Grade products to the listing photo. All listings with C-Grade images are noted. What does new open unit mean? New open unit products are ones that have not been used, but the box seal was broken. Any handling was for inspection purposes only and you can be assured the product is like-new…just with a lower price. Is there a Certificate of Authenticity (COA) sticker with the laptop. No. Most of our laptops are Windows 10 digitally licensed with a downgrade to Windows 7, so it does not have a COA sticker. The machine will be activated as soon as you connect to internet. My printer tells me the ink cartridge is incompatible. What do I do? 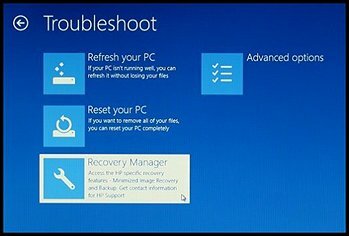 How do I restore my computer? To download your printer driver to you computer for you HP Printer follow the steps below. Driver-Product Installation Software - this full software solution is the same solution as the in-box CD that came with your printer. Order Physical Media-CD/DVD/USB - through this you can order a physical CD that will have the drive software on it. To print to your HP Printer using Apple AirPrint visit HP Support and follow the directions on screen. Chromebook: Connecting to the Internet. 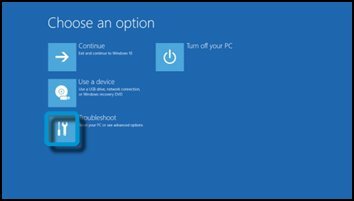 Turn on the computer and repeatedly press the F11 key, about once every second, until the "Choose and Option" screen is displayed, and then continue. On the "Choose an Option" screen, click Troubleshoot. 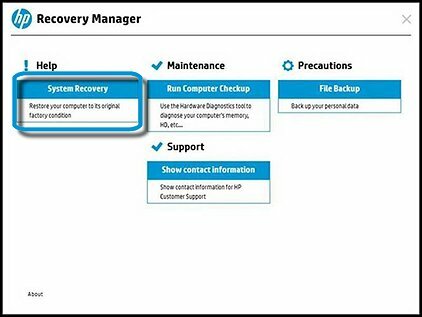 On the Troubleshoot screen, clickRecovery Manager. 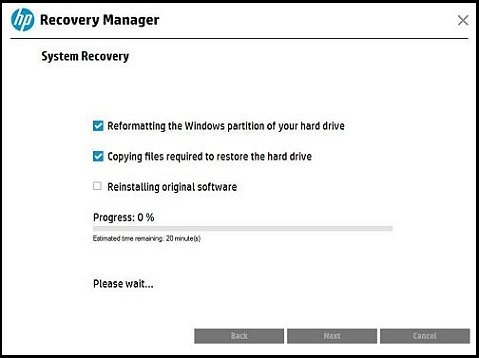 When Recovery Manager prompts you to back up your files, select a backup option: select Recover without backing up your files, and then click Next. Continue to the next step. 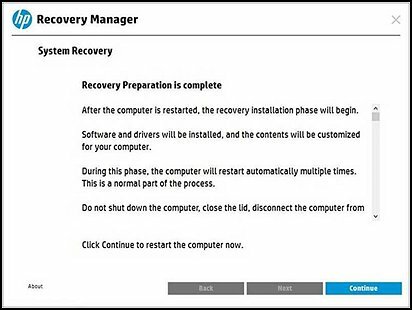 The Welcome to HP Recovery Manager screen is displayed. NOTE: This process can take as long as 30 to 45 minutes. 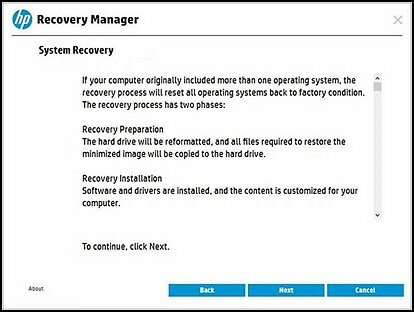 Do not interrupt HP Recovery Manager during the recovery process. Once you have done that, you will see a list of various models within that group of HP printers – click on your specific model from those options. Once you do that you arrive at a page that will look similar to the one below. This is where you can select a topic and view troubleshooting tips, or even update/download latest drivers/firmware/etc (these additional options are on the left side in blue). In the “Select a Topic” drop down menu you will choose “Jams and Feed Problems”. Please follow the instructions for this process. If that does not fix the issue then please do a hard reset on the printer. Please be aware that this will erase any configurations you may already have on your printer such as wireless connectivity to your network, etc..A lot of times this will clear out any false paper jam issues you may be experiencing. You can find the info on how to do a hard reset by searching in the area shown below by typing in your model number and then the term “hard reset". If for some reason this does not produce the desired results, you can download the user guide on this page as well. When you have the user guide opened, press the “CTRL” button on bottom left side of keyboard and while the button is held press the “F” key. These two keys pressed together (CTRL then F) will open a little box in upper right hand side allowing you to search the entire document by a word. Type in the word “reset” which will bring you to the reset instructions for your model printer.